Hi everyone! I’m so excited to begin a new series with you today. I came up with the idea while writing 16 Fantastic Ways to Buy Thrift Store Gifts. Umm that was last year! This year I’m going to show you just how you can truly give a beautiful gift for $10 or much less. I realize that many may be put off by the idea of Thrift Store Gifts, but I’m hoping that by the time my series is over you will be excited to create some of these super simple and inexpensive up~cycled gifts for your special someone! Listen, I have very little time to do very intricate time consuming crafts or gifts, so I can promise you…these are going to be sooo easy! The series will be about 10 weeks long, so if you don’t want to miss one of these projects, sign up for the newsletter at the end of the post…ok!? I know that you have seen these before, but I’ve made tons of these and they are just too easy, versatile and fun not to show you. Even my teens think these are pretty cool! So keep that teen in mind when creating something cool like this. First I’d like to say, if you find a really pretty tray that you can’t imagine painting…don’t! 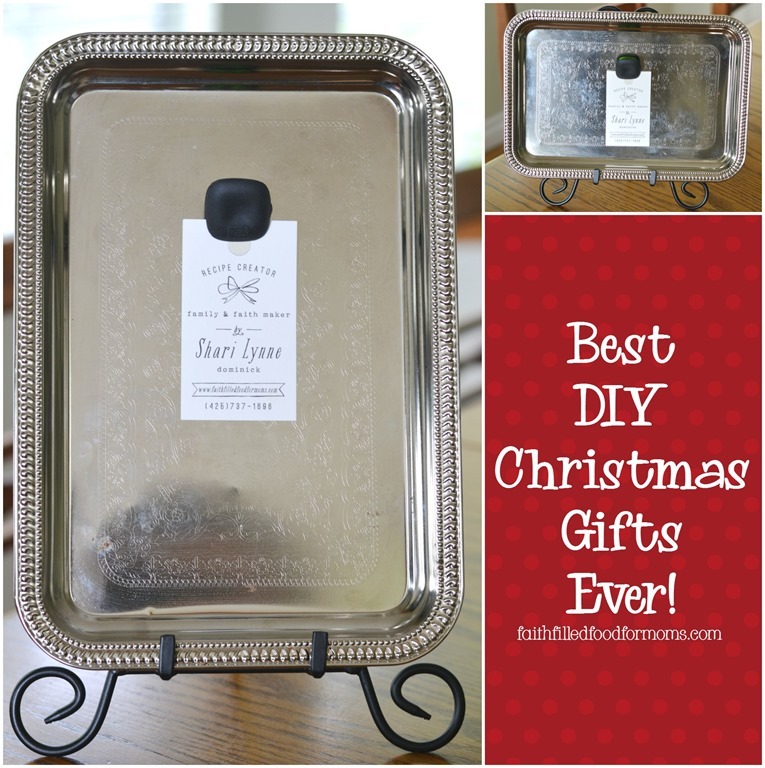 You can still give a beautiful gift, that is functional and fun. 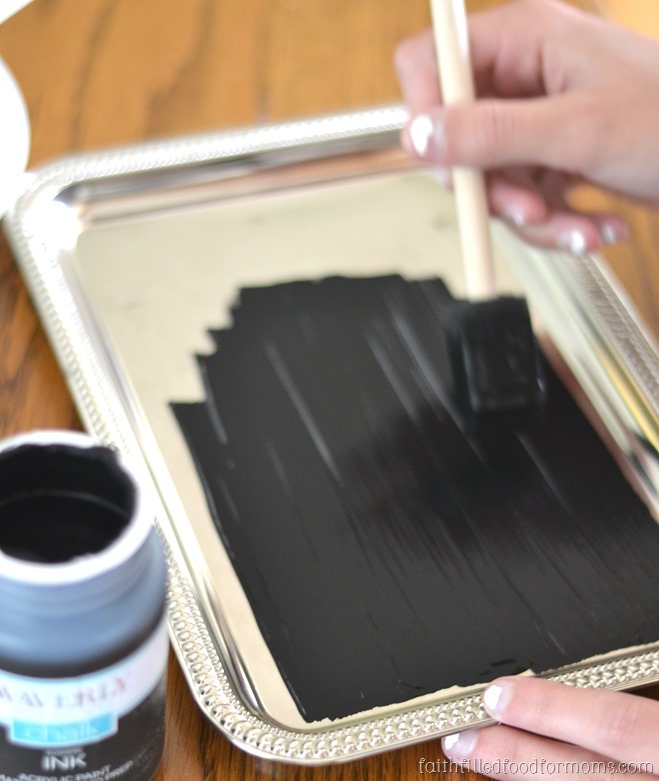 So you decide to paint ~ Paint with Chalkboard Paint. Have an able bodied child/teen…they would love to do this 2 min. paint job for you! Yep…my teen even ASKED if she could do it!? Let dry and then decide if you need to give another coat. I only gave one. Tips: Make sure that the chalk you use is not sharp. It will scratch the paint off. Rub the brand new chalk on paper to smooth out the sharp edges. Also, you will want to “condition” chalk board tray by rubbing the chalk back and forth on it’s side. Then wipe clean with a slightly damp cloth. Boom, it’s ready for your sweet messages. By the way…you could do this on a super pretty plate, be creative! Remember there are all different sizes and shapes of trays. Not everyone has to get the same exact gift from you. 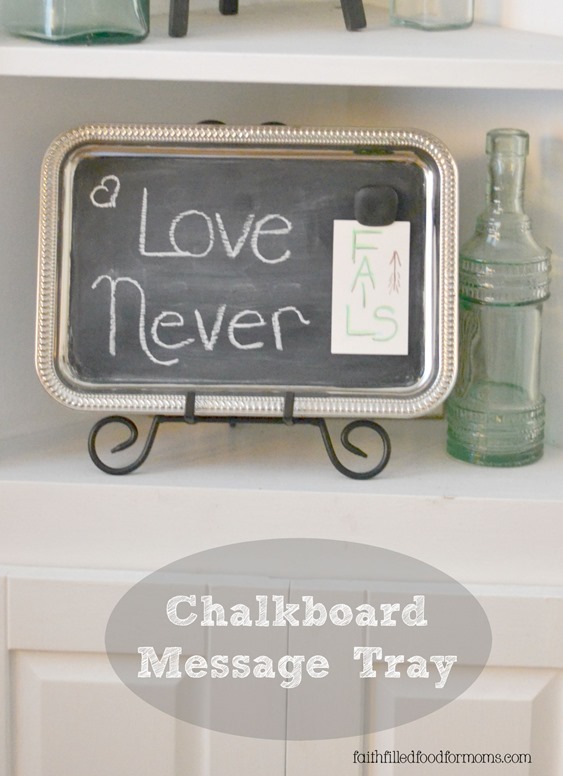 Use the Chalkboard Message Tray in your kids bathroom for sweet messages, use it in the kitchen as a recipe holder or grocery list, use it in your entry way to greet your guests! 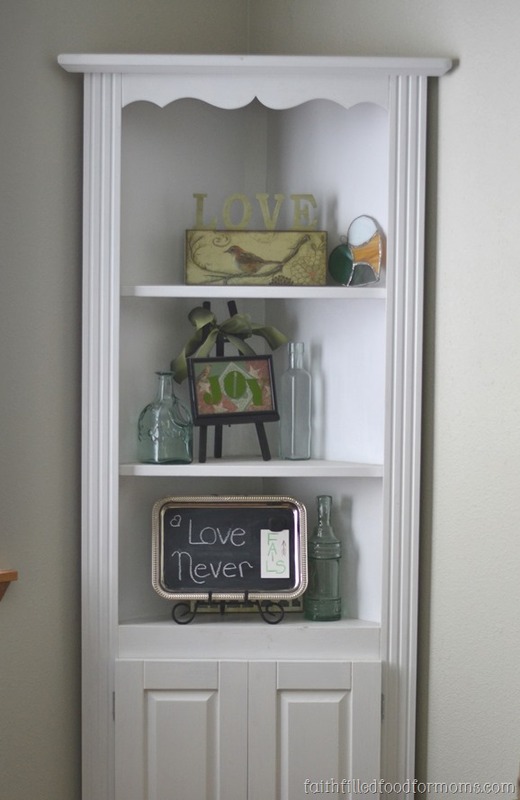 Picture Stand ~ I already had one but you can get these at the dollar store, garage sales, thrift stores for cheap. OR you can order in quantity from amazon and make tons of these for gifts. Everyone has a message, wants a message or well… wants to ignore the message. HA! I can assure you though…your loved ones will love this fun, simple and sweet gift! That is the cutest and useful thing I have seen today. I have yet to try anything with chalk paint, but you have made this look so easy!! 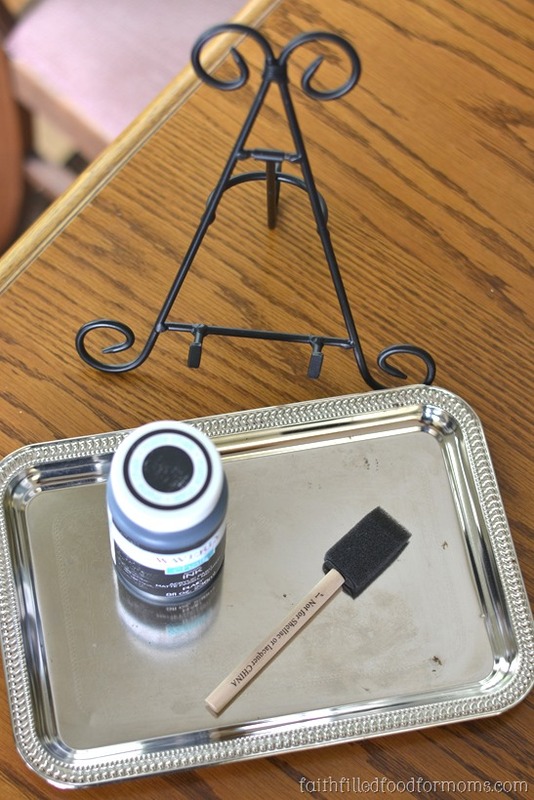 Chalk paint seems like such a versatile thing for crafting – I’ve only tried it on one project so far myself. Your tray turned out cute! That looks great! You’ve given me an idea for a gift for my mom who recently re-did her kitchen – this would match perfectly! I am so glad that these ideas are helpful Anne-Marie! I can totally relate to lean times…since we’ve been a season of “lean” for about 15 years! LOL Have a blessed week! Oh my gosh, this is an absolutely adorable idea! This is awesome! It turned out great. Thanks for sharing at Merry Monday.